Some of the vegetables I have purchased from local farmers recently. I love this time of year. My garden is producing (a little – I’m really not very good at gardening) and the local farm stands and farmers’ markets are overflowing with produce. 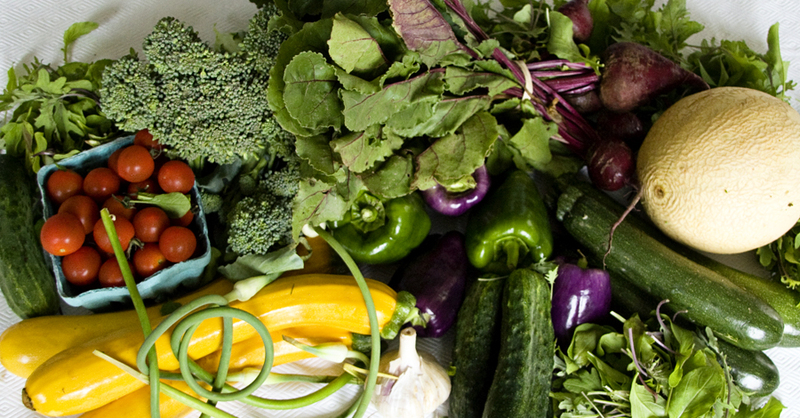 This is the time of year for shunning the big grocery store for most of our meat and produce. Why would anyone want fruit or vegetables picked when they are not quite ripe, shipped halfway around the world, and then gassed to ripen before they hit the shelves when local produce just picked off the plant at the peak of ripeness is available? Local food is usually harvested at the peak of ripeness thereby having both optimal nutrient content and flavor. Small family farms usually use much less pesticide, if any, than mega-farms. Heirloom varieties and more unusual hybrids are more likely to be available at local stands. Far less fuel is used getting the produce and meat to market. Local meat is usually grass-fed (when seasons allow) and so is healthier and more flavorful. But make sure you ask. An added plus is you are supporting the local farmers who help to maintain the diversity in our crops. Stop by these farm stands and farmers’ markets on a regular basis and watch for “sales” when some of the produce is starting to overwhelm them. It’s a great time to buy up a lot and freeze or can it for the winter. I have put together a resource list of directories of farm stands and farmers’ markets across the USA. If you have any sources you think I should add, please give me a shout in the comment section. I can’t list individual farm stands or markets, but if you know of a state-wide directory please let me know. I would love to have a similar resource for other countries. If you are one of my international readers and know of a similar directory for your country or an area of your country, please send me a message in the comment section! THIS IS PART 18 IN THE SERIES 52 WEEKS OF HEALTH. IF YOU ARE JUST JOINING US PLEASE START AT THE BEGINNING AND SLOWLY DEVELOP HEALTHY HABITS.